You can imagine my surprise when I finally found a picture of the fish in question. That’s a freaky fish indeed, and it seems that very little imagination would be necessary to get this fellow looking like a scary fish! So I looked around some more and found all sorts of information, including this little tidbit that seems to provide all the information you might need (sorry, link died). You see, apparently this vicious beast is the female of the species! And you thought human women were bad! Luckily they only live at depths of 1,600 to 10,000 feet! I even found a picture of a live one (or a recently live one – about halfway down the page). Strangely enough, this beast is not the ugliest creature in the ocean. No, that honor belongs to the Fangtooth, a fish so bizarre, that he actually has sheaths in his head for his teeth to slide into when his mouth closes (about one-third of the way down the page)! And that’s not all – don’t skip the main creature feature, more creatures and still more creatures. Pages courtesy of the Norfanz Voyage web site. 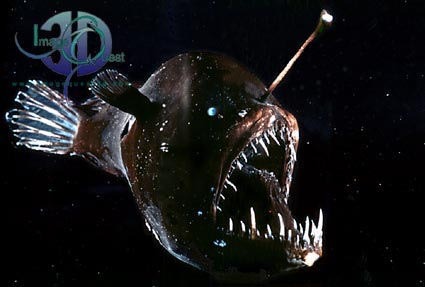 Here is a video from our scientific expedition of a real anglerfish! Hello! I was wondering if you could have one as a pet they are very facinating and awesome. I can get the suplies and what is need but I cannot find one for sale.